Crayola's famous crayons are available in a large size, perfect for smaller hands that are learning to grip and control. 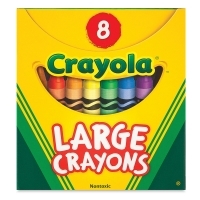 Crayola Large Size Crayons measure 4" long × 7/16" diameter (100 mm × 11 mm). Large Crayons in Bulk —Keep your Crayola Large Size Crayon sets complete! Replenish the most popular colors in sets and classroom packages as your children use them and lose them. Purchase 12 large crayons of 1 color in a tuck box. 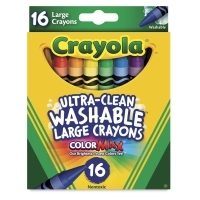 Ultra-Clean Washable Crayons — Great for use at school or home, these washable crayons are specially designed to create less mess! 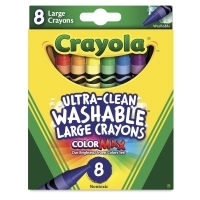 Crayola Ultra-Clean Washable Crayons feature an Ultra-Clean formula that easily washes from skin, clothing, and even painted walls. Featuring classic colors as well as bright, fun shades, they inspire self-expression and imaginative play. Set of 8 — Set contains the colors Red, Orange, Yellow, Blue, Green, Violet, Brown, and Black. 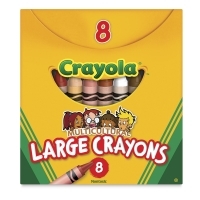 Multicultural Crayons — Crayola Multicultural Crayons are available in a large size as well. The set contains 6 skin tone colors plus black and white. These colors can be blended to create all the skin tones of the world. Packed in a tuck box. Set of 16 — Set contains the 8 colors listed above, plus Blue-Green, Peach, Carnation Pink, Red-Orange, Red-Violet, White, Yellow-Green, and Yellow-Orange. Large Crayon Classpack — Your best classroom buy is the classpack, which contains 400 large size crayons in the following 8 assorted colors: Black, Blue, Brown, Green,Orange, Red, Violet, and Yellow. They're packed in a sturdy hinged-lid corrugated box, with dividers to help you separate them, sort them, and keep them organized by color.